Yerevan Brandy Factory, which became very popular all over the world, was founded on the ruins of the city fortress in far 1887. Nerses Tairyants, the founder of the factory, was not able to assume that its production will grow to a national scale and will be sold in France, the birthplace of cognac. Yerevan Brandy Company became world-wide famous in 1902, when the master Mushinyants created cognac “Choice Fin-Champagne”, and sent its samples incognito to the International Wine Exhibition in Paris. When it became known that cognac was produced not in France, by way of exception Armenian winemakers were entitled to write on their bottles the word "cognac" except the word "brandy" as it was in other countries. In 1913, when businessman Shustov became the owner of the factory, it was awarded the status of "the supplier of His Imperial Majesty’s court". It was the symbol of superior quality of cognac produced at the factory. In addition Shustov developed the enterprise, starting from production of alcoholic beverages of more wide ranges. However, in 1922, during the establishment of Soviet power in Armenia, the factory was nationalized. It favored the further development. The factory became to be called as "Yerevan Brandy Factory”. In 1953 the plant moved to the new complex, occupying the area of 7 hectares of land. Workshops, laboratory, and a huge storage facility for ageing were placed here. Approximately 15 million liters of alcohol of various ageing and tinctures are stored here. Some of them have been stored from the XIX century and this amount will be enough for 30 years of autonomous work of the plant. In 1998, the Yerevan Brandy Factory became a part of the international company Pernod Ricard, which is the third largest wine producer in the world. This was due to the plant was in financial difficulties to provide resources and equipment after Armenia obtained independence. The French firm has saved the company. Today the staff consists of masters who studied the technology from the older generation of workers of Yerevan Cognac Factory. Thanks to these people and wonderful Armenian grapes such drink as “Armenian cognac” exists. For more than a century the company received seven Grand Prix, 108 gold, 48 silver and 8 bronze medals at various international competitions and exhibitions. 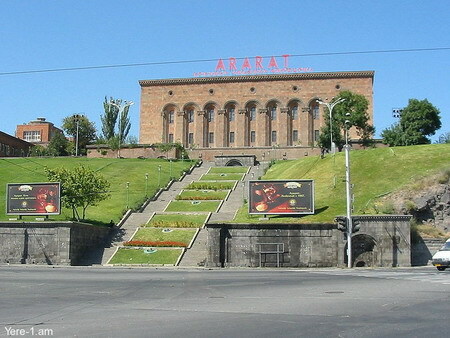 Yerevan Cognac Factory organizes tours, where everyone can get acquainted with the history of this famous company, watch the process of production, and, of course, enjoy the best varieties of Armenian cognac "Ararat".